SARASOTA, FLA. — United States Navy Fleet Marine Infantry Corpsman, Christopher W. Scott of Sarasota, Fla., was named the 2019 honoree of Sticks for Soldiers Florida, a non-profit lacrosse organization, originally founded in Connecticut, with a mission to provide financial support to U.S. service men and women in need. Deployed during Operation Iraqi Freedom in 2007, Chris was severely wounded by an explosive device, but continued his service by future deployments, including Operation Enduring Freedom (Afghanistan) and the Humanitarian effort in Haiti. To support Chris and Sticks for Soldiers Florida, four lacrosse teams from Cardinal Mooney Catholic High School (Sarasota), Riverview High School (Sarasota), Saint John Paul II Academy (Boca Raton) and Admiral Farragut Academy (St. Petersburg) held a weekend-long tournament. Each school not only competed on the field in lacrosse, but also off-the-field in fundraising. 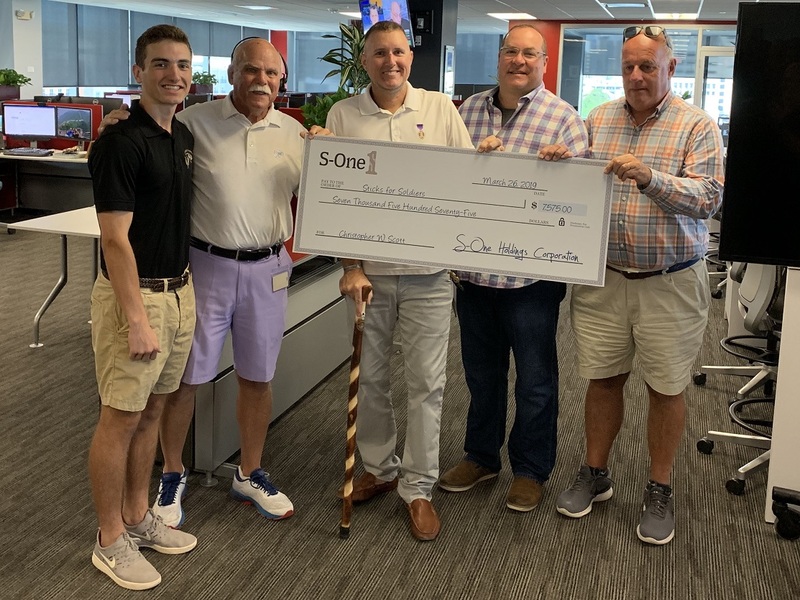 With the funds going to such a great cause, the employees from S-One Holdings Corporation set a goal to raise $3,250, with the company promising to match up to $3,250. When the numbers were finalized, S-One’s employees raised $4,325, plus the company match, for a total final donation of $7,575. With an introduction from Coach Donovan, Chris talked about the impact this program has not only on the honorees, but also on future generations. S-One is proud to present this donation to the Sticks for Soldiers organization. If you are interested in learning more about this cause, visit sticksforsoldiers.org or follow them on Twitter: @sticks4soldiers.